How many copies would you like to buy? 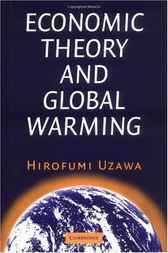 In this book, Professor Uzawa modifies and extends the theoretical premises of orthodox economic theory to those broad enough to be capable of analyzing the phenomena related to environmental disequilibrium, particularly global warming, and of finding institutional arrangements and policy measures that may bring about a more optimal state where natural and institutional components are harmoniously blended. He constructs a theoretical framework in which three major problems concerning global environmental issues may effectively be addressed. First, all phenomena involved with global environmental issues exhibit externalities of one kind or another. Secondly, global environmental issues involve international and intergenerational equity and justice. Thirdly, global environmental issues concern the management of the atmosphere, the oceans, water, soil, and other natural resources that have to be decided by a consensus of all affected countries.